Late Night Kids & Friends is a narrative improv show, which means that the entirety of the performance is improvised as the actresses and actors develop a story on stage. On June 13, before the show began, the audience was asked to give a theme for the evening, in the form of a piece of advice they were given as children. The chosen suggestion was “don’t beat your brother,” which informed the next 40 minutes of the performance. While there was a lot of friction between the characters, they never resorted to violence; the advice of the night was loosely applied, but never explicitly referred to. The universe in which the improv show unfolds remains the same every night, but the performances can go in any direction. Linda Cajuste, both creator of Late Night Kids & Friends and improvisator, came up with the concept of the show, and the world in which it is set. Cajuste also created the characters, who are all very distinct from one another, and each have a thing. For instance, Coach Charlie is deeply involved in sports, Shy Shy Molly is the reserved reader, and 8-Bit Bobby is the gamer. Cajuste shared that she wrote the characters with a balance in mind, she wanted to make them lovable but flawed. All of them are coworkers, members of the cast of the fictional children’s TV show Late Night Kids & Friends. 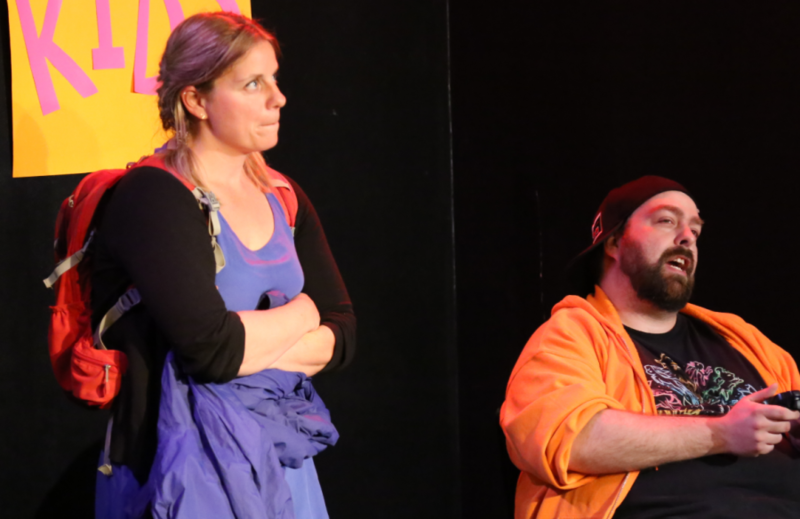 During the improv show, the audience got to see segments from the television show and the backstage drama. “They take their characters beyond what I imagined,” said Cajuste about the cast of Late Night Kids. While it is her project, she explained that the actors and actresses developed the characters throughout by practicing . This review is for a show revolving around the rivalry between two competing segments of the television show. Actors Paul Piro, playing Coach Charlie, and Brad Kane, playing 8-Bit Bobby, shared many scenes together, revealing a sweet complicity between them. They were comfortable together, and their scenes propelled the story forward. The highlight of the evening was Kadi Diop as Shy Shy Molly, who was delightful in playing an understated character with humour. However, the lack of props made the show a little hard to follow at times; the pretend objects could be confusing and I didn’t always know what they referred to. Late Night Kids & Friends was a pleasurable experience, for it brought me back to childhood. The actors and actresses’ joy in improvising reminded of playtime; exercising imagination for the sake of enjoying it. “It is a fantastic community,” said Piro about the Fringe Festival. “Everyone here, regardless of what your show is about, regardless if you like the material or not, everyone supports each other to kinda just do your thing, and respect each other. It’s a real safe space, it really makes it easy to enjoy what you’re doing,” he concluded.